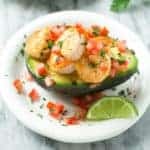 Ripe avocado halves stuffed with chili spiced shrimp, herbs, and tomatoes. Heat the olive oil in a medium-sized pan over medium-high heat. Season the shrimp with chili powder and salt to taste, then add them to the pan. Cook, stirring occasionally, for approximately 3 minutes, or until shrimp and pink and opaque. Pour the lime juice over the shrimp, toss to coat. Season the avocado halves with salt and pepper. Spoon the shrimp mixture evenly into each avocado half. Sprinkle with tomatoes and cilantro and serve.